Regal bridal set including everything a bride needs & all matching pieces. This regal jewelry is in antique gold colour (gold with black antique) & many different colours, set with faux pearl & crystal diamante stones. Jewellery set includes choker necklace, multi-layer kundan & faux pearl rani haar necklace, simple kundan flower earrings, 2x hath panjas, nath (nose ring) & clean matha patti. Indian Jewellery Store LOVES this product. 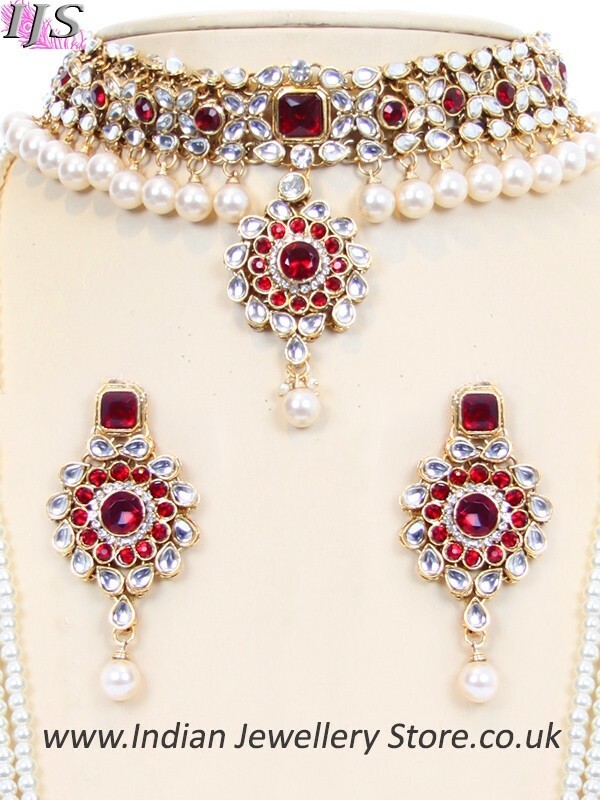 This Indian bridal set is bang on trend for 2019 and perfect for a bride who is looking to achieve a regal look at a good price. This jewellery is an exclusive piece thus has limited stock.